A year and a half ago, the site of what's now Cana Vineyards (38600 John Mosby Highway, Middleburg, Va.) was just a hay farm. 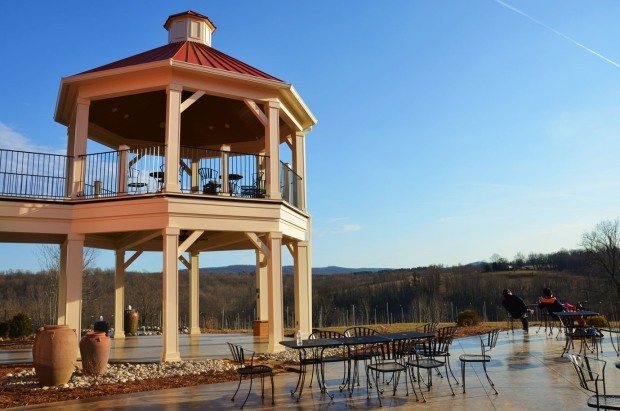 Now it's a blossoming winery with one of the best views of the Bull Run Mountains. Cana -- which opened its doors this past September -- is a developing winery with only a few months under its belt. Since their own vines need time to mature, the 2011 vintage was made with grapes purchased from four other Loudoun County vineyards. Despite the fact that Cana's still in its early phase, you'll still find plenty of reasons to visit: the killer porch that overlooks the mountains, the classic rock in the tasting room, and the fact that every weekend, they rock out to live music in one form or another. If you're mainly going for the wine, you'll find Viognier, Riesling, Traminette, Cabernet Franc, Merlot, and Petit Verdot. We recommend the 2011 Viognier; it's peachy keen (and it smells like peaches). Hours for the tasting room are Thursday, Saturday, Sunday and Monday, 11 a.m. to 6 p.m., and Friday 11 a.m. to 9 p.m. The tasting fee is $10 and includes a commemorative wine glass. Cana is located about 40 minutes from downtown D.C.